When West Indies came to England in 1976, did people in the UK realise that Clive Lloyd's team would go on to dominate world cricket for the best part of 20 years? West Indies had won the World Cup the previous year, but were then thrashed 5-1 in Australia. Garry Sobers, Rohan Kanhai and Lance Gibbs had recently retired. A new generation of West Indian players, Viv Richards, Gordon Greenidge, Andy Roberts and Michael Holding, would go on to become household names. But in 1976, these players were as yet unproven at the highest level. England opener Dennis Amiss played with Alvin Kallicharran and Deryck Murray at Warwickshire. Amiss It was no great surprise. They had a good track record and also some experienced players. We'd met most of them on the 1974 tour and were lucky to come away with a draw. By 1976, those players had been together for two more years. Barbados and Warwickshire fast bowler Bill Bourne had played youth cricket in West Indies with and against Lawrence Rowe, Larry Gomes, Bernard Julien, Collis King and Raphick Jumadeen. Bourne We were hopeful for something special as our regional tournament was tough, but the results were better than expected. David Steele, England batsman I didn't think about how good they were going to be; just turned up and played. They'd had a battering in Australia from Lillee and Thomson. They didn't like it up 'em either. Gordon Greenidge, West Indies opener We lost 5-1 in Australia - got a real thrashing from a very professional, hard, unified side. After that, we became more committed and started playing for each other. Bourne The 1975 World Cup win gives a better indication of how good that team was. Our athleticism, fitness level and fielding ability easily surpassed that of the other teams. England had seen plenty of West Indies quick bowlers, like Andy Roberts, Vanburn Holder and Bernard Julien, in county cricket. In the second tour match, against Hampshire, Lloyd unleashed a new fast bowling star. Andy Murtagh, Hampshire We'd heard about Michael Holding, but no one had seen him bowl over here. Watching from the pavilion, as he ran in from practically the sightscreen, was the most beautiful, terrifying sight I've ever seen. He was frighteningly fast. There was one ball I just didn't see. I remember it thudding into Deryck Murray's gloves and the slips going "Whooooah." John Arlott put it rather well in the Times the following day: "Murtagh's ability to miss the right ball finally deserted him." Frank Hayes, England batsman Peter Lever had seen Holding in West Indies during our winter and said he was rapid. When we played against Holding in a tour game in 1974, he only bowled military medium. Amiss Reports from Australia were that he'd bowled quickly out there. Steele We knew they'd be quick and they were. Andy Roberts was the best. He'd run up the same as normal and bowl something a yard quicker. 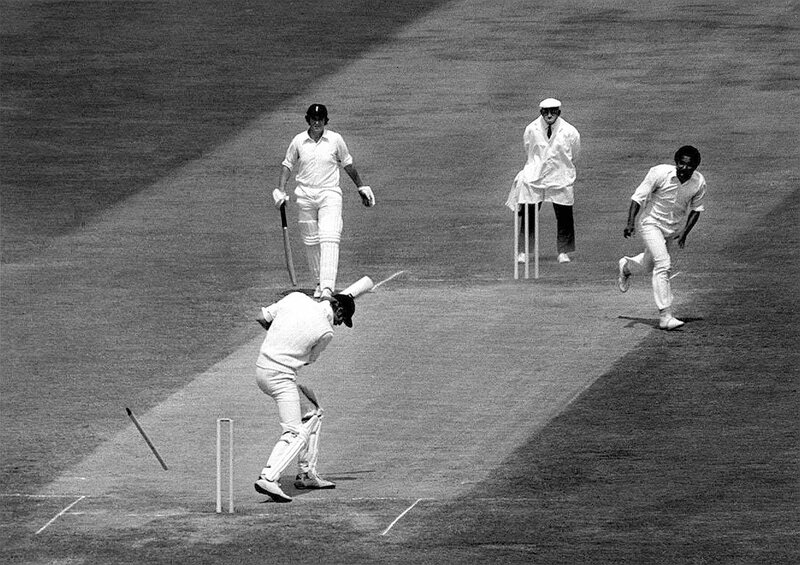 Murtagh For Hampshire against West Indies in 1973, Roberts broke Steve Camacho's jaw. He was only young and hadn't quite learned how to control it, but my god, he was quick. Hayes Geoff Boycott used to say that Vanburn Holder and Keith Boyce would bowl a yard quicker in Tests than they did in county cricket. They weren't in the same bracket as Holding, Roberts and [Wayne] Daniel. Those three bowled 90mph plus, all the time, 95mph at their quickest. Wayne Daniel could be frighteningly fast, and make it swing. Sometimes his yorker ended up around shoulder height. He'd always apologise, though. Steele Daniel got bounce, hit the deck. Big chap. Strange that he didn't play too many Test matches. A lovely variety of fast bowlers. Amiss Vanburn Holder could bowl quickly when he got his rhythm right and there was a bit in the wicket. Often, though, he would bowl within himself. Bourne Holder's line and length were impeccable. Other bowlers got wickets because of him. People looked at the pace of Andy and Michael, but the other bowlers played their part very well. For the first two Tests, England held their own. 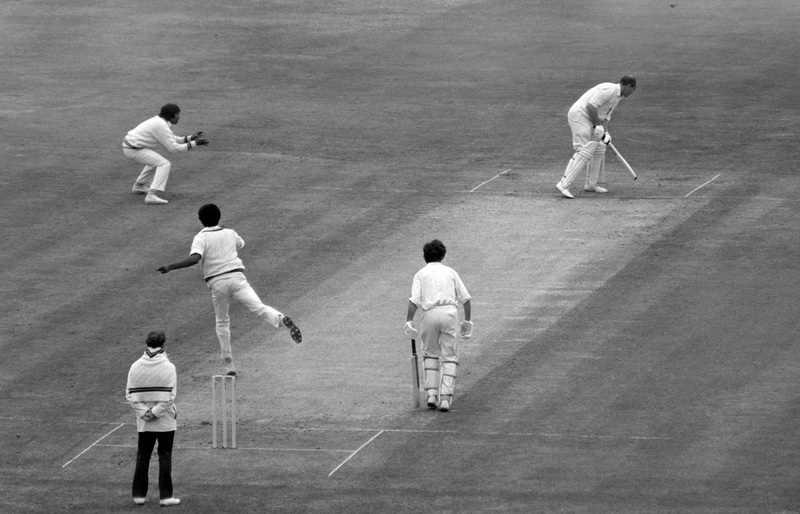 Dogged pros like Steele, Brian Close and John Edrich kept the West Indies pacemen at bay. Steele I tried to wear everybody down. That's what I was all about. They were very difficult to wear down, though. For Australia, the previous year, Lillee and Thomson were outstanding, and the first change was Max Walker. But after that they had nothing; Ashley Mallett the offspinner, but not a lot of back-up. West Indies were at you all the time. 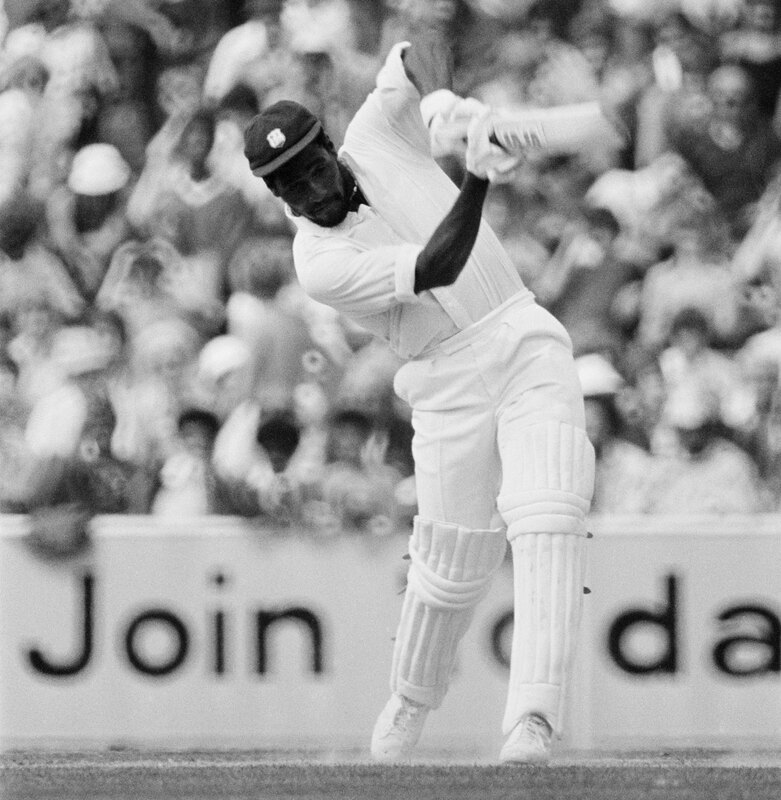 In the first Test, Viv Richards smashed 232. In the fifth he made 291 and finished the series with 829 runs. He was 24 years old. Amiss Viv we saw in the West Indies, in 1974. He got a few for the Leeward Islands in a tour game. It didn't matter where you bowled to him, he'd find a way to get runs. Hayes In that [Leeward Islands] match he got 40-odd, very quickly before lunch. I remember thinking: this guy could play a bit. But back in the changing room, some of the quicks were calling him a slogger. Jim Parks, played with Richards at Somerset in 1974 From the minute we saw him we knew he was going to be something special. In one of his first games, against Gloucestershire, he got a hundred and smashed them to all parts. Took bowlers on, technique was good, had every shot in the book. Bourne Vanburn Holder had told me to expect something special from Viv. After a rain-affected draw at Lord's, West Indies won the third Test, at Old Trafford, by 425 runs on a pitch suited to their fast bowlers. Hayes The week before, I played at Old Trafford for Lancashire against Surrey and when John Edrich saw the Test wicket he started to limp. The square had been deteriorating all season. It looked white, green, white, green - undulating. There was a drought on too, so cracks opened. People thought it was one of the worst Test wickets they'd ever seen. It looked like a bad track and it played like a bad'un as well. Steele Nightmare surface, shocker, dangerous wicket. Roberts, Holding and Daniel battered England into submission. Brian Close and John Edrich, in particular, took a fearsome going over. England selected medium-pacers Mike Selvey, Mike Hendrick and Tony Greig. Hayes Brian Close said they had three cannons and we had three pea-shooters. Steele It finished John Edrich. He got fed up waiting for them to bowl. With those long run-ups, if there were a couple of no-balls, an over could last 12 minutes. No restriction on over rates back then. Sometimes Edrich would wait for them at the non-striker's end. He was good at that. Closey got battered on purpose. We'd done very well up to that point. Hayes It was my comeback Test. I took my first ball against Andy Roberts - it went through the top of the track, puff of dust, and I gloved it and was caught first ball. I remember thinking, "Good grief, there's not a thing I could have done about that." Greenidge People said that we didn't play the game in the right spirit. That was disappointing, because we always believed that we did. If any team had the type of fast bowling armoury that we had, they would have used it in the same way. It was just unfortunate we were bowling at those particular players [Close was 46, Edrich 39]. That wasn't our call. England had selected them. And actually I thought that they handled themselves reasonably well. But people said that we were violent, bringing the game to disrepute, not playing the game in the right manner. We were fierce and competitive and that was all. Despite the wicket, Greenidge managed to score two hundreds at Old Trafford. Murtagh Barry Richards [who opened with Greenidge at Hampshire] told me that Gordon had worked out that to make a name for himself, get into the Test side, he had to make big hundreds. To cash in once he was in. After that he started to concentrate rather than try to smash every ball for six, which he tended to do when he was younger. Gordon grew up in England, on English wickets, from age 14. Greenidge It helped my technique. You'd play on lots of different surfaces, on uncovered wickets, which I thought were unfair to the batsman. The bowler's run-up was covered, so he'd have a dry spot to land on. Sometimes our bats had more mud on them than ball marks. And you had to score fast to set up a win inside three days. Those pitches made you think. 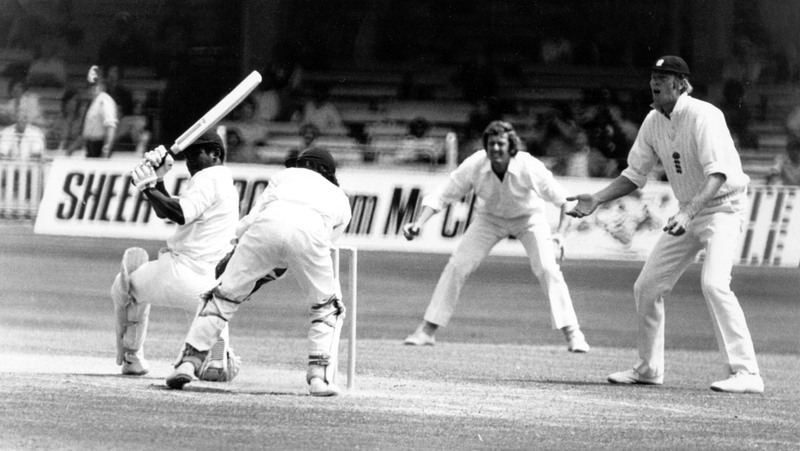 Amiss When West Indies came over in 1976, nearly all of them had experience of English conditions. Greenidge Playing on softer surfaces with swing and a lot of seam movement would help people develop their techniques. You didn't get out-and-out quick bowlers, just people who can use the conditions well. For the fourth Test, at Headingley, England chose their own fast bowlers. Bob Willis, John Snow and Alan Ward took 18 wickets between them, but West Indies still won by 55 runs. The tourists won the final match, at The Oval, too, by 231 runs, thanks to Richards' 291 and Michael Holding's 14 wickets. Amiss Having four fast bowlers meant they could play with greater intensity. Clive Lloyd could just rotate them and keep the pressure up. Before that, West Indies always had spinners. They had some good experienced players too. Alvin Kallicharran could score runs on any type of wicket against the best bowlers. I remember, one game against Worcestershire, first ball, on a green wicket, Alvin smashed a Vanburn Holder bouncer for six. That's how you see them off, he told me. Bourne Lawrence Rowe was an extraordinary player at youth level. So very compact, composed and attractive in his strokeplay. Amiss Our Warwickshire coach, Tiger Smith, said that Clive Lloyd was the best natural batsman he ever saw. It wasn't just the quality of players that made that West Indies side special. It was also the way they played their cricket. Steele Excellent team. Confident. Something a bit different. Amiss They knew they could play, had pure belief that they were good. They were a good side and happy side who enjoyed their cricket but played hard to win all the time. Hayes They didn't appear to be coached, they played the most spontaneous shots. Fabulous side. Bourne Previous players were good, but not as ruthlessly professional as Lloyd's players. They had a point to prove to the sceptics back home, and probably made greater sacrifices in order to be the best team. Their success made us very proud as West Indians living in England. Back then even people who didn't play were thought of as cricketers. Greenidge We were a bunch of guys that came together and gelled well as a fighting unit. Can't say more than that.